Hale Leys United scored four goals in the final 20 minutes to come from 3-1 down and claim a dramatic 5-3 victory over Totternhoe on Saturday, taking them a step closer to retaining their South Midlands Division Two title. 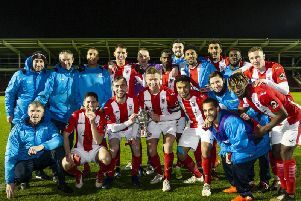 Once again Hale manager Paul Alleyne was forced into several changes from his side’s 8-1 thumping over Ealing Town the previous Tuesday, with Daniel Parsons, Riccardo Whittle, Jack Bowers and Unas Ilyas joining the ever-growing injury list. And the depleted hosts struggled for their usual fluency in the opening half with a defensive error putting the visitors into a shock 1-0 lead before a well-struck effort from Graham brought United level, but Totternhoe continued to make all the running as they restored their lead at half-time. The second half picked up from where the first left off with the league leaders remaining on the back foot and Totternhoe capitalised with a well-taken third goal on 70 minutes. Finally, though, this seemed to sting Hale into life and the home side began to wrestle control of the game with Graham rising highest to nod in his second of the day. That was closely followed by Marcus Hussey’s goal to bring Hale back on level terms before, with 10 minutes on the clock, Roni Joe brilliantly converted a 30-yard free-kick put United ahead for the first time. Kevin Mealor then wrapped up victory with a free-kick of his own in stoppage time. However, despite the victory, Alleyne was far from happy at the full-time whistle. He said: “I’m not going to make excuses. We didn’t start playing until the final 25 minutes of the game. “If we had we applied ourselves earlier in the match, we wouldn’t have had to work as hard in the closing minutes. “Roni Joe’s free-kick was the decisive goal, however credit must go to Nathan Graham as without his energy and constant pressure, we might not have got back into the game. “Every point counts now we’re into the final eight games of the season. We have four at home and four away and we need to work hard in training to make sure we do not start another game like this again. Hale, who now only need four more wins to secure the Division Two title, are without a match this weekend before returning to action at home to bottom side Willen on Saturday, March 21, at 3pm at the Fairford Leys Ground.